I don’t make many new baby cards, so I had a lot of fun creating this one! The card had to be gender neutral, therefore, I really wanted to include yellows and greens as colours (the rest of them kind of just joined the party unexpectedly). Instead of choosing a conventional baby-themed paper pad, I reached for a happy summer one - Echo Park “Summer Bliss”, bright fun colours and patterns jumped at me straight away. I like to add layers to my cards as that creates interest and dimension. I picked four different matching patterns from the paper collection, and arranged them in such a way that I could showcase all of them. I am a stamper, so the focal point of my pieces are usually hand-coloured images. 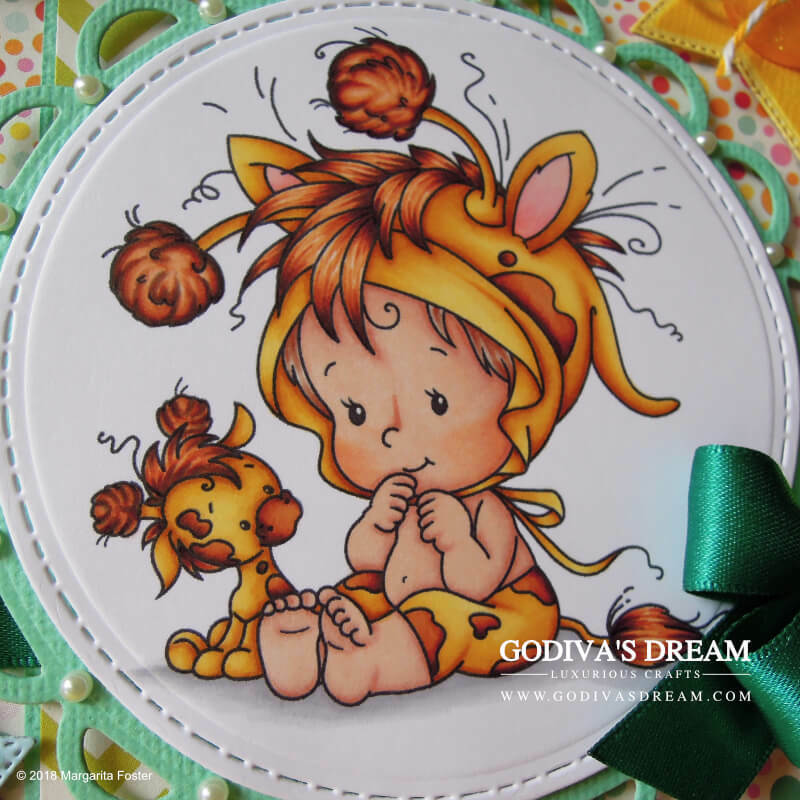 For this particular card I chose an extremely cute Baby Giraffe by Wee Stamps. The artist is Sylvia Zet and her images are nothing short of adorable. I used a digital image, but Whimsy Stamps manufacture these in rubber. I mainly use Promarker/Brushmarker markers for colouring. They really excel in bright shades. Once I’ve coloured the image, I cut it out using a stitched circle die and mounted it on a lacey circle die cut (Spellbinders S4-293) in the shame shade as my matting and layering cardstock. I use textured American Crafts cardstock, it’s fantastic quality and comes in a huge variety of shades, shame it’s rather hard to get hold of here in the UK. Ribbons with double loop bows are my signature after years of crating. There’s elegance and fun in ribbons, and double loops are just that little bit more special than singles. 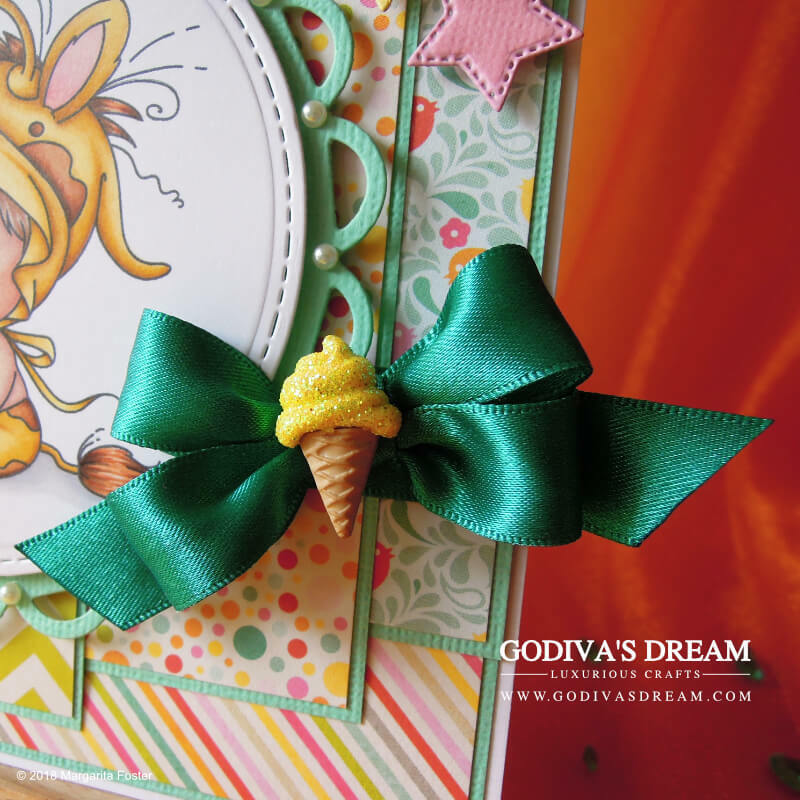 Thus, a bow with a fun yellow glitter ice cream cone in the centre landed on this card. In addition to the bow, I added some colourful stars as a hint to the nursery rhyme “Twinkle Twinkle Little Star”, plus, they looked quite sweet! I stuck a translucent yellow button with some twine in the middle of the largest star, which, straight away gave me an idea for the sentiment. “Cute as a button”! It matches the card and it suits the occasion rather well. Do you often make new baby cards? What are your favourite colours to use on them - are you a traditionalist and enjoy pink and blue or chose something less conventional? Let me know in the comments and thank you for reading!